The 2011 Bullion Gold Eagle marks the twenty-sixth annual strike for the United States Mint program which debuted in 1986. The one ounce coins were released for sale by the US Mint to its network of authorized purchasers beginning on January 3, 2011. The series was authorized by the Gold Bullion Coin Act of 1985. The eagles are considered the official gold bullion coins of the United States. Each is struck from 22 karat gold which is composed of 91.67% gold, plus 3% silver and a balance of 5.33% copper to enhance their durability. The composition is known by some as crown gold as it has been the standard for gold coins in England since the 1500’s. Since their introduction, American Gold Eagles have become a leading investment option for many around the world looking to add small amounts of gold to their portfolios. That decision to invest in such a product is backed by the United States government with a guarantee for each coin’s content, weight and purity. 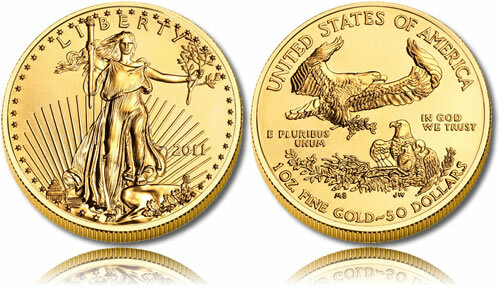 A total of four sizes of the bullion Gold Eagles are typically struck annually by the US Mint. The most popular is the one ounce Eagle which features a legal tender face value of $50. Also produced are 1/2 ounce, 1/4 ounce and 1/10 ounce Gold Eagles which have face values of $25, $10 and $5, respectively. Despite the legal tender status, however, the true value of each coin is their intrinsic value which is tied to the current market price of the gold contained within each strike. Since their introduction, all of the Gold American Eagles contain a version of Liberty on their obverse taken from the 1907-1933 $20 gold piece originally designed by artist Augustus Saint-Gaudens. Many consider this design of Liberty to be one of the most beautiful ever struck on a United States coin. The reverse shows sculptor Miley Busiek’s male eagle with an olive branch in its beak flying above a nest containing a female eagle and her hatchlings. The US Mint also typically produces proof and uncirculated versions of the Gold Eagle for collectors which it sells directly to the public. This is in contrast to the bullion Eagles which are sold through the Mint’s network of authorized purchasers in order to make the coin’s readily available at near-market prices.